The synagogue at Korazin/Chorazin dates to the Talmudic Period. It was built out of carved local Basalt stones and was probably repaired/rebuilt in the early 5th century. It is "basilica" in design with a central nave, two side aisles, and a rear aisle. It faces south, towards Jerusalem, and its three main doors are on the south side of the building. This style of synagogue is called the "Galilean Type" and similar examples have been found at Capernaum and Baram. 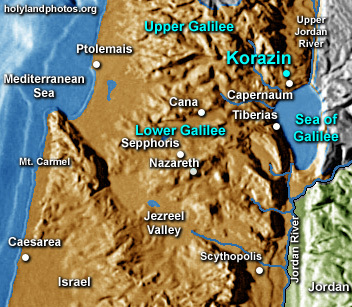 To view the site of Korazin Click Here.